Bill English has declared he will vote against any euthanasia bill put before the parliament. no debate, no reading the legislation, he is just going to let his Catholic dogma dictate how he will vote. This is a typical Slater-type attack – Slater has been very critical of English in the past so this is not out of the ordinary. So far. And now we see one of the problems with MMP and scum list MPs. They don’t have an electorate to listen to or canvas. They are representative of no one but themselves and the party.Electorate MPs like Nick Smith always survey their electorate and debate the issues with voters. Much and all as I dislike Nick Smith’s politics, in person he is a top bloke, he keeps getting elected with massive majorities because he listens to his constituents. Slater also campaigned against MMP so it’s no surprise to see him slamming list MPs. Until English retired from his Clutha-Southland electorate and went onto the list only last year he kept getting elected with massive majorities. In 2011 with a majority of 16,168 he got 21,375 votes, over twice as many as all other candidates combined. Bill English has to listen to no one but his stroppy missus. This is a low blow from Slater, Bringing English’s wife into is a low blow. Again this isn’t out of the ordinary for Slater, he was particularly nasty during National’s Northland candidate selection slinging dirt involving the family of one candidate. That’s a bit harsh. Bill is entitled to his opinion as you are of your opinion. Yes he is but I don’t want his personal religious beliefs to dictate what I wish to happen if the occasion arises. I would like to make my own decision and have it written down for when I am too ill to fight for that right. Right, you’ve now lost me. When you call Bill English a”scum list MP”, that shows you to be in the same loony class as those you keep referring to as the Green Taliban and I have laughed with you at their silly antics. I happen to think, also that the Greens are loony. But I also think that there are some areas where people are entitled to exercise their consciences, and the sanctity of life is one such area. Would you prefer him to say one thing and do another (as so many people do)? At least we know where he stands. While I might not agree with his views, I respect his right to have them. Catholic or not, this is the sort of arrogance we saw from Cullen. Please remind me who got National down to the miraculous 20% threshold? English’s expertise lies within financial management. I for one am happy he is no where near social policy. He doesn’t have a clue and doesn’t gauge with the public very well. His deputy, Mr English, a Catholic, said today he would vote against any law change. “The law says that if the doctor helps them die that would be breaking the law and that’s what the judgment said pretty clearly,” Mr English said on TVNZ‘s Q&A programme. Mr English, whose wife is a GP, said he personally did not believe the law needed to change. “My personal view is that the law is where it should be,” he said. While polls show a sizeable majority of people support euthanasia there are still many who oppose it, and they have as much right to be represented in Parliament as anyone. Mr Slater seems intent on re-creating himself as a man of unlovely disposition. I used to enjoy some of his more outrageous observations but, really, he has descended to a level of almost perpetual ad hominism ( if that is a word). The site very rarely contains anything of any interest other than his own insatiable desire to be heard. @ Nookin – WO makes his distaste of English pretty obvious. But to attack English’s wife, who to the best of my knowledge has never tried to impose her personal views on the electorate is poor form indeed. Slater is entitled to his own view, and calling MPs ‘scum’ is typical of his critical approach, but using family members in political criticism crosses a line for most people. Asentati Lote-Taylor to come back as NZ First’s new list MP? If Winston Peters wins the Northland by-election he will become an electorate MP. Under our MMP rules he then has the option to resign as a list MP, which he would be expected to do. This means that NZ First can get a new MP into Parliament to restore their election result dictated quota. It is often claimed that the new MP would be Ria Bond from Invercargill as she is next on the NZ First list. She would certainly get the option to take up a seat in Parliament. But she could either be genuinely unwilling, or she could be pressured to be unwilling to allow someone else to claim the seat. And Peters has said as much on The Nation last weekend – “We have not chosen the next candidate”. Gower: Well, tell the people of Northland, because if you win this seat, Ria Bond comes in on the list, doesn’t she? Peters: No, no. We have not chosen the next candidate in the context. The rule is the next available candidate, so please don’t forecast what we haven’t worked out ourselves. So Peters is saying “we” will work out/choose who”the next available candidate” is from the NZ First list. It wouldn’t be the first time a list has been manipulated like this. In 2008 after Russel Norman was chosen by the Green as new co-leader he was declared elected to parliament when Nandor Tanczos resigned after the two next on the list, Mike Ward and Catherine Delahunty ‘agreed to stand aside’. So it could be any of the list candidates who replaces Peters as a list MP. If any of them didn’t follow a Peters directive to stand aside to clear the way for who ‘we’ choose they would be likely to have a difficult time in the NZ First caucus. 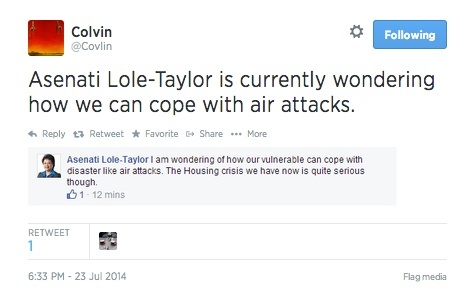 But it’s not likely to be Asenati Lote-Taylor as it looked like she was demoted out of harms way down the list. Her biggest claim to fame while she was in Parliament last term was not being able to tell her Twitter account apart from a spoof account (I often had to check carefully to see whether it was the MP tweeting or not). So if the next on the list is unwilling by choice or coercion to be a member of Parliament the next on the list is offered the vacancy until a willing replacement is found. How should an MP prioritise their responsibilities? Should they work for the party, the country or themselves? They are elected by the people of their electorate but some (possibly many) of their votes will have been more for the party than the persdon. I’d like to find out what people think of what are the most important duties and responsibilities of an MP. And how should they prioritise what is most important?